The first of these fairs was held in 2008, shortly after Cyclone Nargis made its devastating landfall. This year, write organizers at the Moegyo Humanitarian Foundation, "We are very pleased that we are able to serve hard-to-find special dishes to our visitors. 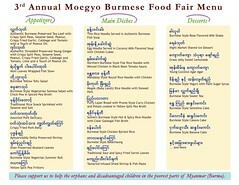 Even many Burmese contacts are telling us that it will be a special treat. As in previous years, we will be serving the dishes at a very reasonable price to raise money for the orphans and disadvantaged children in the poorest parts of Myanmar (Burma)." The 2010 food fair will be held on Sunday, June 13 (which gives you all Saturday to enjoy the Big Apple Barbecue Block Party). Click the photo for a closer look at what's on offer, then line up some dining buddies — when else will you find a Burmese feast like this? That same Sunday might also be occasion to try Bromo Satay House; according to a fellow working on the awning, that long-in-coming Indonesian eatery is almost ready to open. Ryan Skeen's latest restaurant, 5 & Diamond, will begin Sunday brunch service on Easter, and an abbreviated weekday breakfast (coffee and pastries, 7:00-10:00) the following day. Doc's, the mainly-takeout joint from the founder of Amy Ruth's, was shuttered on a recent midafternoon, and repeated telephone calls have gone unanswered. While admiring a mural-in-progress that would brighten the side wall of a Washington Heights pharmacy, I spent a few minutes chatting with the photographer (in red), taking one for the team. He's from Peru, and when not serving as a group leader with Fresh Youth Initiatives, for the authentic flavors of his home country he favors Pio Pio Riko, in Sunnyside (a distinct operation from the small Pio Pio empire), and Don Alex, in Corona. A gentleman outside Delicious BBQ mentioned that beginning July 18, on Saturdays there'll be Filipino grilling going on in the Meadowlands parking lot. Only for a couple of months, I imagine, between the finale of the State Fair Meadowlands in early July and the kickoff of the big tailgating season in September. 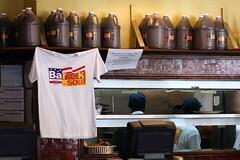 Celebrated BBQ restaurant Rack & Soul has lined up behind the Barack Obama presidential campaign in name, if not pronunciation. Word of Mouth: Will Wondees Never Cease? (This venue is closed.) After opening a second and a third Wondee within several blocks of the original — the best of the three, by my lights, especially now that the owners have dimmed that laundromat glare — this Thai mini-chain is stepping out of Hell's Kitchen and opening a fourth location in Morningside Heights, just south of Columbia University. Almost across the street from the well-regarded Thai Market, Wondee Siam IV will occupy a narrow but quite deep space formerly occupied by the B. Cohen hardware store. 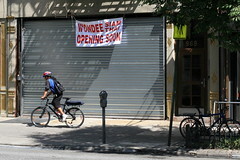 The owners plan a September opening, a staffer at the original Wondee said on Saturday — right on time for the returning Columbia crowd. That delivery man, from the Domino's next door, will be sharing his lonely "bike lane" very soon. At the food bazaar outside the Al-Hikmah mosque, sometime between my combro and my cendol, I sat down with a few fellows to talk about their idea of authentic Indonesian food. In Queens, Whitney Ave. neighbors Mie Jakarta and Minangasli each got a mention, and surprisingly, so did Bali Nusa Indah, on Ninth Ave. in Manhattan. When I asked the fellows about the best of the lot, though, Upi Jaya was the unhesitating consensus choice; from what I gathered, the others don't even come close. 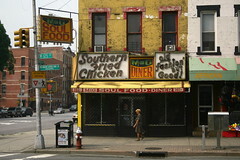 Word of Mouth: A last shout-out from the "soul food diner"
Writes a longtime employee of M&G: "I am sorry to say that now it is officially over the diner has been sold we left for vacation on june 29 2008 we will not be back. We are very sorry about the inconvenience to the loyal customers who stuck by us over the years and to all newcomers, onetimers, tourist, walkins just everybody who has ever eaten there, all the young people who made M&G's the late nite place to be back when we were 24hrs. WE WILL TRULY MISS YOU ALL"
Until recently this storefront sold pet supplies; renovations by a new tenant revealed stained glass from a soda fountain called Wetter's. 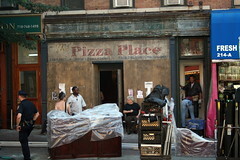 Now the glass has been covered again, but only for a short time; The Pizza Place is a fictional setting (click for a better view, and note the 555 telephone exchange) for a new movie called "I Hate Valentine's Day." In the near future the building will house a second outlet of Slope Cellars, a wine and spirits store on Seventh Ave.; expect stained glass, but no slices. Word of Mouth: Personal pizzaiolo on Avenue J? 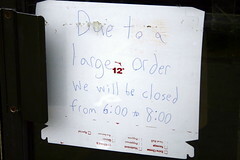 If your sights were set on a DiFara slice last Saturday evening and you arrived much after 5:00 (allowing for the usual waiting time), you were plumb out of luck. (Click on the photo, or any other, for a better view.) The sum of Dom DeMarco's efforts — a score of cheese, sausage, mushroom, and pepperoni pizzas, with basil all around — were destined for a single festive Midwood residence, where they arrived shortly after the exchange of vows. (Congratulations and best wishes, Gil and Gaby!) If you'd like that sort of service yourself, I gathered from the father of the groom, it helps to be a customer of long standing; knowing the pizzaiolo for 40-some years earns you a certain amount of goodwill.